I’ve always been one to regularly make and write goals. I hoped my diligence naturally gave me an edge on the life and biz success track. 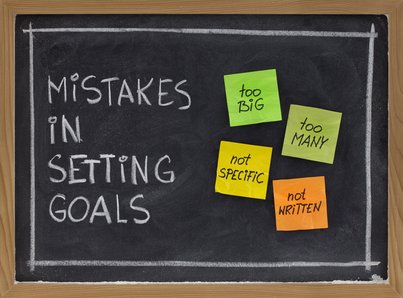 Having goals has certainly helped, but goal setting is a learned art and science. The power of goals comes from activating and uniting your unconscious mind that influences 95% of your behavior with your conscious mind and actions. If your goals contain incongruences or conflicts, you end up with a psychic misconnection. This disconnect doesn’t propel you forward, but keeps you in a fog, usually in hit-or-miss action, and delivers lackluster goal outcomes. In an effort to cover all the bases, I’ve made lengthy lists of goals in all areas. But too many goals indicate unclear priorities and overloads your brain. Narrow to four or so your top priorities so you can focus and complete certain objectives. In the future you can replace the completed goals with new initiatives. Putting lists of written goals in a drawer will have a minor effect on their fulfilment. You must find a way to incorporate and integrate the goals you set into your behavior. The best avenue is via your calendar. Break down your goals into action steps. Input those regular or time-specific action steps into your calendar. You can also review a list of new habits you want to develop in your morning and night prayer time. Creating tracking sheets is another way to stay accountable, like tracking your weight daily or your daily review of your financial information. Without analyzing your process on a goal, it’s easy to keep passing that goal forward to the next month, and the next, and the next. Are you guilty of trying to lose the same five pounds for the last four years? When you review and analyze your goals, you ask questions. Are you not losing the five pounds because you are exercising, or you are eating too many sweets, or you aren’t getting enough sleep? Take the answers to those questions and rework the action steps necessary to achieve those goals for improved results. As busy mompreneurs know, each change of season can warrant re-looking at goals and schedules, etc. My father (who’s also a colleague) recently passed away, which triggered a need to re-evaluate my goals. Feeling confused, unproductive, anxious, scattered can all signal outdated goals. Your brain has lost its focus and has you moving aimlessly looking for a course correction. Simply sitting down and reworking your goals can often provide immediate relief and clarity to your next steps. Your goals are what make your business and life vision a reality. Harness their power now by seeing if yours need a tune-up or an overhaul. The Catholic Mompreneur’s Biz and Life Tip: Schedule an hour with yourself today for some effective goal setting.